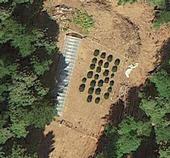 Google Earth Image of a cannabis grow site. The resolution of Google Earth images allowed the researchers to detect marijuana plants that were previously missed with other remote sensing techniques. As policy liberalization rapidly transforms the multi-billion-dollar cannabis agriculture industry in the United States, the need for regulation and assessment of environmental impacts becomes increasingly apparent. A recent study led by UC Cooperative Extension specialist Van Butsic used high resolution satellite imagery to conduct a systematic survey of cannabis production and to explore its potential ecological consequences. While the legality of California’s medical marijuana dispensaries is being debated in courtrooms, a UC Cooperative Extension forestry and wildlands ecology advisor says there are a number of issues related to the unregulated land-use practices of illicit cannabis growing that have not been addressed. Geographic information system (GIS) models developed at UC Davis are being used to pinpoint the best farmland for conservation in the Central Valley. A new landscape-scale method, described in a recent issue of California Agriculture journal, was applied in Fresno County, and the approach is being extended regionally in the San Joaquin Valley.